Like in years past, it takes a certain kind of result to truly convince everyone that the top preseason teams are truly worth of the spot. In recent years, those teams have often included Alabama and Oregon, and like in these past couple of years, the Crimson Tide and Ducks passed that early test. The respective victories over Texas A&M and Tennessee in week three staked Alabama and Oregon to a large lead in the early simulations of the BCS rankings. In fact, the distance between Alabama and Oregon, which is still around a sizable .04, is less than a third of the gap between Oregon and No. 3 Clemson. We’re ONLY using the available, reasonably well-connected and up-to-date BCS computers, which at this point is just Massey’s non-BCS, Sagarin’s and Billingsley’s rankings. You’ll notice that at this point, “well-connected” means computer systems with a preseason bias and component. As the season progresses we can eliminate those rankings which hold such a bias as the teams become well-connected in 2013 alone. Available computers, but not included: Massey’s BCS and Colley’s Matrix. You might have noticed that Stanford and Clemson flip-flop again this week, thought their differences are small when you look at the bound either team would have to make an impact on the top two squads in the country. Weeks of lingering in the lower regions of the computer rankings continues for Ohio State, but the Buckeyes are finally able to leap into the top five at No. 5 — up one spot — despite it’s much higher viewing in the polls. A first major upset of the season always seems to re-center the focus of the college football nation. In 2012, that upset came courtesy of a Stanford victory over previously feared USC, and the rankings certainly reflect the impact of such a result. Most notably, USC tumbles in our latest simulated BCS rankings, which still have Alabama and LSU well above the rest of the competition. The surprises come almost immediately after that, however, as Georgia springboards past South Carolina into the top-five simulated BCS rankings. Then at No. 5, Stanford appears on the strength of the nation’s second-best computer aggregate score, trailing only Alabama in that category. Despite not getting the bounce they might have expected after the upset of the No. 2 or No. 3 team in the country — depending who you asked — the Cardinal certainly enjoyed a bounce in the BCS rankings, landing at No. 5. Finally seeing some support from the computers, Florida State enters the top 10, at No. 8. And Notre Dame, on the strength of their victory over previously loved Michigan State, also enters the top 10 of the simulated BCS rankings for the first time. West Virginia is still suffering from a lack of support from the computers, sitting at No. 12 in the simulation despite No. 8 and No. 7 votes of confidence from the polls. These simulated rankings are not necessarily the most accurate in terms of reflecting the actual components of the BCS, but they do give an interesting first look at the BCS picture. Without the Harris Interactive Poll (1/3 of the formula) and two of the six computers (all six of which account for another third), these rankings are about 56 percent “complete.” What we do have, however, is the USA Today Coaches’ Poll, as well as early looks at Kenneth Massey, Richard Billingsley, Jeff Sagarin and the Colley Matrix, for what we’d call a 56 percent confidence that these rankings are a “good” reflection of the BCS. Among the four computer rankings we’re using, only Kenneth Massey’s is the non-BCS version, as his non-margin of victory rankings are not well-connected enough yet to signify an accurate ranking. We’ll likely cross that threshold next week. We took a computer aggregate without eliminating any of the four available to keep extra transparency, but kept the formula for the human elements intact while subbing the AP Poll for the Harris Poll. The first BCS rankings will be available in October, but for now, this will have to do. Enjoy! After the season’s first major upset, USC plummets to No. 12 in the most recent USA Today Coaches’ Poll as Stanford climbs to No.11 following their upset victory. Oregon takes over USC’s previously held No. 3 position, with No. 4 Florida State and No. 5 Oklahoma rounding out the poll’s top five. The SEC lands their normal top two here, as Alabama claims 54 first-place votes and a .996 vote share, while LSU claims the other five, with a .957 vote share. Georgia is up to No. 6, while South Carolina grabs the No. 8 spot. Note: These projections are from Sept. 16, 2012. 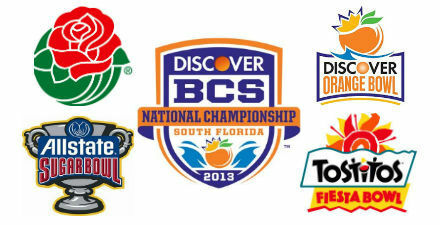 Check out the most recent BCS projections. One loss should not define a team’s season, especially not one that happens early in the year. Say, one in the third week. But a loss in college football, where the BCS reigns supreme? That might be a different story. Fiesta Bowl West Virginia vs. Michigan St. In fact, never in the history of the BCS has a Pac-12 team advanced to the BCS title game after suffering a regular season loss. At any point in the season. So yep, the bowl picture shuffles. And shuffles severely. Let’s see what happens next week. Comment: One USC loss, and suddenly the pack of four teams head and shoulders above the rest of the country is now three. Oregon slides up, and with LSU and Alabama on a collision course for each other, running the table might easily mean a berth in the national title game for the Ducks. Comment: Just three weekends into the college football season and the Big Ten already seems an unsolvable enigma. Michigan comes out in the first week and looks silly against Alabama. Wisconsin is unable to move the ball in a shocking loss to Oregon State. Then Michigan State can’t hang with Notre Dame. So who’s the class of the Big Ten? At least for now, it’s Michigan, who heads to the Rose Bowl on an auto-bid. A 10-win USC is still strong enough to convince the always game Rose Bowl to call the Trojans into town. Comment: Alabama ran ramshackle through the Arkansas defense and continues to look every bit the defending national champion. But should they lose to LSU, the Sugar Bowl is a nice, soft landing spot. Oklahoma sat at home, probably watching in awe as the Tide ripped the Razorbacks apart. Would the Sooners like to see the Tide in New Orleans? Comment: Whatever monkey Wake Forest had proven Florida State’s back in the past few years was dealt with early on Saturday, and the Seminoles cruised their way to a victory, again looking the part of ACC champs. A showdown with Clemson next weekend will go a long way to proving that. Louisville survived a fourth-quarter scare from North Carolina, and the Big East is looking a bit reinvigorated these days, with the Cardinals leading the way. Comment: West Virginia looks every bit the role of Big 12 champion, while Michigan State had a hard time even putting up the three points they scored against Notre Dame. But you can’t simply forget the first two weeks of the season, where the Spartans looked strong. A 10-2 or even a 9-3 Michigan State squad might be a strong at-large contender.